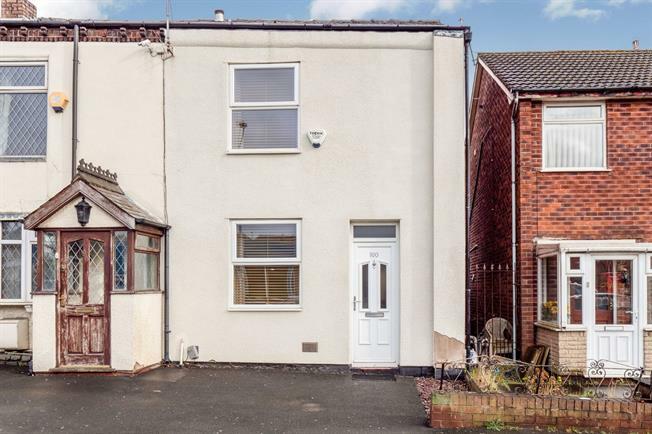 Beautifully presented throughout and ready to move straight into, this property is centrally located and ideal for first time buyers. Featuring a spacious lounge and a modern fitted kitchen with integrated appliances and breakfast bar. To the first floor are two double bedrooms, the master benefitting from fitted wardrobes, and a contemporary bathroom suite. Externally there is a great size, block paved rear garden with gated access to the rear off road parking. Further benefitting from a recently fitted gas central heating system and double glazed windows throughout, viewings are highly recommended! UPVC front double glazed door. Double glazed uPVC window facing the front. Radiator and electric fire, laminate flooring. UPVC back double glazed door, opening onto the garden. Double glazed uPVC window facing the rear. Radiator, tiled flooring, boiler, part tiled walls. Granite effect work surface, wall and base units, stainless steel sink with mixer tap and drainer, integrated electric oven, integrated gas hob, over hob extractor, space for washing machine and fridge/freezer. Double bedroom; double glazed uPVC window facing the front. Radiator, carpeted flooring, spotlights. Double bedroom; loft access . Double glazed uPVC window facing the rear overlooking the garden. Radiator, carpeted flooring, built-in storage cupboard. Double glazed uPVC window with obscure glass facing the rear. Heated towel rail, vinyl flooring, tiled walls. Low level WC, panelled bath with mixer tap, shower over bath, pedestal sink with mixer tap.